So what is duty free on arrival? 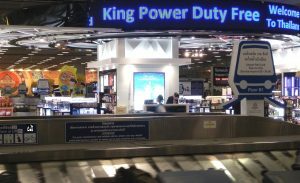 If you live in the USA, Canada or Europe, you’ve probably never heard of duty free on arrival, nor being able to pick up your goods inbound at the duty free arrivals store when collecting your luggage. Baggage claim areas in airports around the world are sprouting arrivals duty free stores next to the carousel. The world market for duty free shopping is still dominated by airports in Europe, the USA and Canada, these were the countries that first expanded this business more than 30 years ago. Today, airports look like shopping Malls with few planes in sight but a multitude of stores all there in the departure lounge, waiting for you to spend, spend spend. You can see people amassing shopping bags in the Terminal and then bundling them in the aircraft overhead lockers. Of course, some airline carry-on baggage rules don’t like this idea because they want to restrict what you carry on board. But, the whole process of shopping in the airport departure lounge has become a massive industry and very important for airport revenues. Then came along strict security regulation, the restrictions on liquids and those low-cost airlines who want every penny off you, especially for all your bags. All this puts the passengers, the Terminals and the Retailers in potential conflict, especially when your airline wants your shopping to be checked into the hold*, or airport Security takes your expensive Cognac off you en-route to your destination. But, if you are Argentinian, Brazilian, Thai, Australian, a Gulf Arab, Egyptian or one of over 70 Nationalities, often from The Southern Hemisphere – it would be second nature for you to plan your shopping at the duty free on arrival, not departure! Why carry your goods all around the world when all you need to do is add them to your cart inbound at the airport? And now, European airports are jumping on the bandwagon too.. but there’s a catch, or at least a potential catch… are these goods really Duty Free? If you are arriving into any European Union Member State, like France or Italy, the answer is no. Arrivals Duty Free is not currently permitted in the EU, so the goods you buy inbound at these airports are all Tax-Paid goods. And it doesn’t matter where you are arriving from, everything will be tax paid. Non-EU States like Iceland, Norway, Switzerland or Turkey bordering Europe, all have real Duty Free arrivals stores in their luggage areas. With proper tax-deducted prices. And they are booming, Oslo has just opened the world’s largest store on landing in airport around the world. But go to Bangkok, Rio, Panama, Sydney, Dubai and many other airports and you will find these stores for you convenience. Meanwhile Lufthansa and Frankfurt airport have just announced the e-commerce portal so incoming travelers can pre-order for delivery of their purchases on arrival too. But, these goods will not be Duty or Tax free for the reasons explained above. * Pack lighter suitcases. World CO2 savings would be 2 million tonnes a year if every airline passenger cut the weight of baggage to below 20 kg and bought duty free goods on arrival. Arrivals Duty Free shopping is expanding, one way or another, with or without tax, so it is best to search for the various rules that apply to your travel plan – and that is the service we provide. Just go to our home page, choose your language flag and enter the airline, airport or destination city or country and check before you fly! *Indian airlines have become very strict on what is known as "the one-bag rule" - what they allow you to carry on board - so be careful. ** You can now pre-order online and in advance for many airports and collect your goods inbound when you land. Para buscar tiendas libres de impuestos, catálogos y precios, ingresa tu ciudad, aeropuerto o país de destino y haga clic "Go". Cuando encuentre la información de su destino haga clic en el icono rojo de Aduanas para la búsqueda restricciones aduaneros. Para encontrar lojas duty free e os preços, inserir aeroporto ou destino, click e Go! A cota de isenção alfandegária refere-se ao seu país de chegada e não ao país de partida. Os regulamentos alfandegários podem ser encontrados clicando no botão aduaneiro para a esquerda ou procurando seu país de destino. Author Arrivals Duty FreePosted on 19th September 2016 7th October 2017 Categories Duty Free ArrivalsTags airport arrival, arrival duty free store, baggage claim area, duty free arrivalsLeave a comment on So what is duty free on arrival?